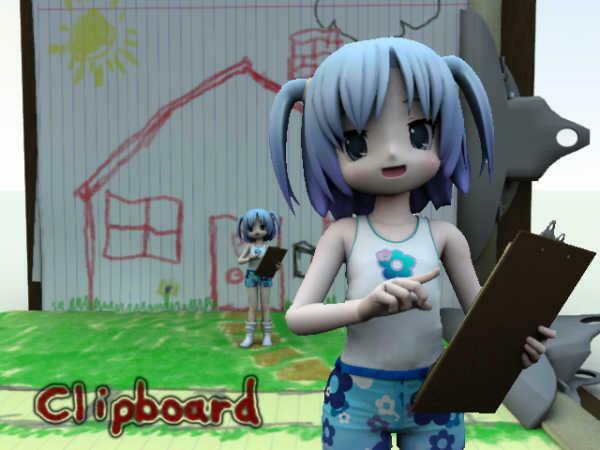 This a simple clipboard prop I made after someone requested one over at the daz3d forums. Turns out there is one in the daz3d freebies. Oh well... with this one you can hide the actual clipboard and have a writing pad. I have included two mat files to turn the paper yellow, or white. The texture maps allow you to put whatever you want on the front page. It also has a working clip, incase you wanna hide the pad of paper and clap something else to the clipboard. Tested in daz studio and poser 7... yada yada yada... see the enclosed freebie for more details. 3Dscreenprint (10 weeks ago) Inappropriate? Moving this clipboard around within the scene is going to be a lengthy process indeed because the coordinances are all off. This is going to be tedious just moving the clipboard into position. dasmotiu (2 years ago) Inappropriate? Still good after all these years. Just what I was looking for. SpicyNiknak (7 years ago) Inappropriate? Jeffrey1960 (9 years ago) Inappropriate? Thanks for the comments. Hopefully there are no errors. This is the result of me looking around for mundane objects to model fairly quickly while learning the software I use. S. Clough (11 years ago) Inappropriate?